I never learned the end of the story; but from them I got my first encounter with fervent faith. Memory of their fervor was refreshed by Jessica Hausner’s Lourdes. 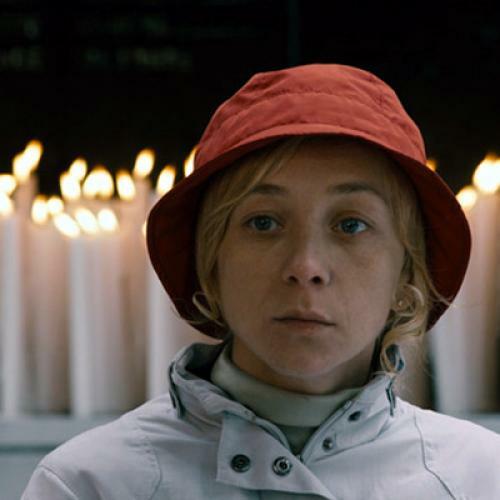 This Austrian director’s film is not a documentary, but it uses its story as a means to explore the procedures at the Lourdes shrine. The film is neither an obeisance nor an exposé: it is a journey through a complex institution founded on faith. Christine, a young woman who is paraplegic and wheelchair-bound, is a member of a group that is on a mission to Lourdes. All visitors--and there are about six million a year from around the world, many of them ambulatory--either come in groups or they are grouped and are assigned a guide. These guides are either women wearing headdresses, nurses’ uniforms, and red cardigans, or they are uniformed men who are members of the Order of Malta. All along the way there are priests as advisers. Hausner’s tone is set at once. The first shot could not be more thoroughly free of bloated religiosity. (Lourdes is not in any industrial sense a “religious” picture.) We see the cafeteria of the sanctuary before visitors arrive: waitresses are setting tables. Choral music filters in, as it occasionally does later. Thus simply, the director tells us that we are in for experience, not proselytizing. Christine’s group arrives, eats--Christine has to be fed--and sets forth on its adventure. There isn’t much of a narrative, just enough to let us see most of the resources of the experience, which takes several days and includes everything from the sacred grotto to the souvenir shop. Though the pilgrims go there for miracles, the church is very strict about determining whether or not they occur. Bernadette Soubirous, a peasant girl in southwestern France, believed that she saw the Virgin Mary here eighteen times in 1858, a belief that is the bedrock of the shrine, which has subsequently had about 200 million visitors. Those who claim that their prayers here cured them of some kind of complaint are put through inquiry by a medical board; if they pass, they face a church board of inquiry. Very many have claimed cures, but only about seventy miracles have been confirmed. (The change must not only really happen, it must last.) Christine is one of the candidates for the miraculous, and we make the journey with her. The archbishop in Shaw’s Saint Joan says, “A miracle is an event that creates faith.” But faith also creates the miracle, apparently. And, as Hausner shows, the miracle also creates jealousy. (“Why did he get helped and not me or my friends?”) So miracles not only help individuals, they also nourish disappointments, with which the priests deal. Hausner’s chief accomplishment in the film, aided by her competent direction and a pleasant cast, is the maintenance of her view. She neither kneels nor winks at us. She presents an activity of faith by fellow human beings, hard or easy though it may be for us to accept it. (A physician tells me that some American Catholic hospitals occasionally send patients to Lourdes with a nurse assistant. Medicine, for these people, finds its appropriate level in the great scheme of things.) The state of mind of those who leave Lourdes still in their wheelchairs is not deeply explored here. But the film is a moving reminder of a fairly universal condition--the hunger for otherness that persists in most human beings, religious or not. Germany continues its stern self-scrutiny. At least since Stalingrad (1993), Germans have been making films that examined various segments of the Nazi past. That this is a sign of generational change is underscored by the latest. Harlan--In the Shadow of “Jew Süss” is completely generational: this documentary concentrates on the children and the grandchildren of a prominent Nazi figure. Veit Harlan was one of the prime film directors of the Hitlerite day. Born in 1899, he began his career in 1926 as an actor--he was a man of striking good looks-and began directing in 1935. (His first marriage, to a Jewish woman, had already been dissolved.) When Hitler and Co. took power, Harlan was compliant, was approved, and kept on working. In 1940 he was commissioned to make the anti-Semitic propaganda film Jew Süss. (The screenplay, bitterly enough, was based on a novel by a Jew, Lion Feuchtwanger, but its treatment of the story was drastically canted for Nazi purposes.) The film won high official admiration. Though there is no means of accurately measuring its malevolent effect, it was seen by millions. Goebbels was so pleased with Harlan that in 1944, by which time World War II was grinding Germany down, he commissioned the director to make a patriotic historical epic called Kolberg, for which--even in those straitened days--more than 200,000 soldiers and sailors were detached to serve as extras. The director, Felix Moeller, has interviewed all those involved, apparently asking sharp questions (which we do not hear) and evoking considered, open replies. The range of response is wide, depending inevitably on the respondent’s age. Harlan’s son Thomas, also a film director, has carried the knowledge of his father’s career through his own life like a kind of therapeutic burden. On the other hand, a granddaughter says that if Harlan had been a Resistance fighter, it would not make her heroic: why, then, should her grandfather’s misdeeds taint her? Though the sense of involvement varies, virtually all Harlan’s descendants have had to evolve some sort of perspective to help them. Cinematically, Moeller flourishes. He shows again, through braided interviews, that talking heads can be used in rhythms and large thematic phrases--with a sense of movement--if the people are interesting. Besides, Moeller has interwoven relevant clips from Harlan’s films and bits of past personal footage to illustrate what is being discussed. The result is a fearfully fascinating and disturbing picture. All of the family want to be treated justly, which is reasonable enough, though of course that justice would not exist if their forebear and his friends had prevailed. Once again history devolves into irony. The foundation was created in 1922 by the mightily rich Albert C. Barnes, a physician who developed medications that were hugely successful. The museum’s condition and position have been the main points of contention. The building is in need of renovation. This and its relative inaccessibility have motivated Philadelphians of some prestige and financial clout to agitate for a new building more accessible to the city. Opposition to these proposals was equally fierce, because Barnes’s will specifies that the collection remain in this building in this locality. The conflict has evoked blasts and counter-blasts and legal proceedings, all of which are now past, according to The Art of the Steal. This lively documentary about the dispute, directed by Don Argott, makes its position known through its title and now serves chiefly as a reminder of how important an aesthetic decision was to a metropolitan community. It closes with a note telling us that the new building is under construction in town and will be ready, with the Barnes collection installed in it, in 2012. But the film says little about the matter in Barnes’s will that seems to me most extraordinary. In one salient aspect Barnes reminds me of the theater director Jerzy Grotowski. When Grotowski’s Polish Laboratory Theatre played in New York in 1969--three productions in an Off-Off-Broadway space--Grotowski himself was in the lobby at the entry to the space for every performance and, with only a glance, vetted each prospective member of the audience. (The attendees never numbered more than sixty.) He could tell at once, at least in his own view, whether he wanted this person to be present when his company strove for profundity. Some well-known people were turned away as--he apparently thought--mere novelty hunters. Grotowski believed that the director always “keeps in mind that he has two ‘ensembles’ to direct: the actors and the spectators. The performance results from an integration of these two ‘ensembles.’” (I saw all three productions, and only a few other times in a lifetime of theater-going have I felt that I was part of a transcendent event.) In short, Grotowski wanted his audience to be collaborative, as far as he could foretell, in what was going to happen. Barnes had much the same idea about his museum. His will stipulated that admission to his collection was mostly to be granted in response to written applications, not all of which would be honored. He loathed those museumgoers who were mere strollers-through or vogue addicts, and frequently said so. He apparently wanted his visitors to know that they were specially privileged--not by him but by the artists. This was no kind of snobbism: he encouraged people from every stratum of society. (His own background was working class.) And it should be noted that on one social subject he was advanced: race. He involved Lincoln University, a historically black college near Philadelphia, in the foundation’s structure from the beginning. Two of the past presidents of the foundation are black men. This selective aspect of the museum will apparently be lost. In the name of democracy, as well as increase in revenues, it seems that admission will be unencumbered by any test of the person’s seriousness. Obviously, the control of museum admissions is a different matter from admissions to a small theater space. But the opponents of the new site, the Barnes loyalists, feel that the Barnes collection will now become just another tourist stop. The matching of art and viewer will no longer be attempted. The intentions of Barnes’s admission plan are now history. Stanley Kauffmann is the film editor of The New Republic.